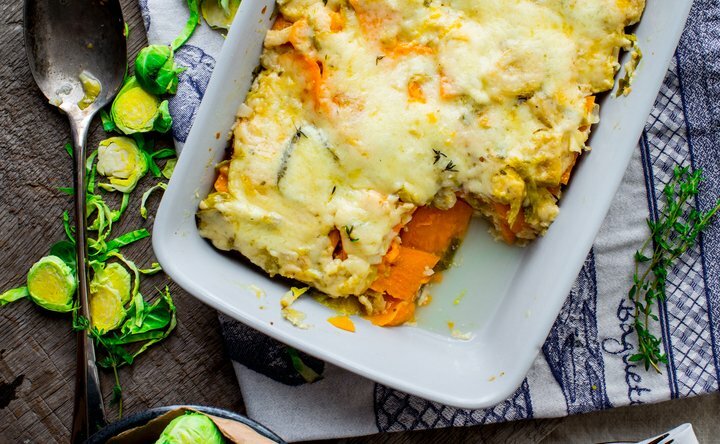 This sweet potato au gratin is layered with very thin slices of sweet potato, Brussels sprouts, shallot, Cabot Farmhouse Reserve Cheddar, and milk, then is slowly baked until the potatoes are very tender and the top is golden brown. It is a delicious accompaniment to a ham dish and is a perfect choice for a potluck. Try it and then share the recipe with friends and family on Facebook, Pinterest, Instagram, and Twitter. To make 12 servings, gather the ingredients listed below. 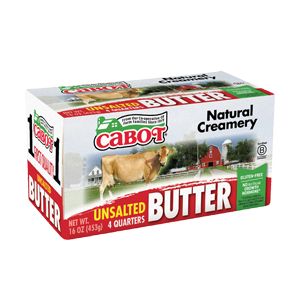 Melt the Cabot Unsalted Butter in a large saucepan over medium-high heat and add flour, stirring to make a thick paste. Then add milk, whisking constantly and continuing to whisk until smooth. Bring to a simmer, whisking often, and then remove from heat. Add 2 cups of shredded Cabot Farmhouse Reserve, whisking until smooth. Add Dijon mustard, salt, thyme, pepper, and nutmeg, whisking to combine. Cover saucepan with the lid and set aside to keep warm. Next, preheat your oven to 350°F and coat a 2½-quart casserole dish with cooking spray. Layer as directed in recipe instructions below and cover with parchment, then aluminum foil. Bake until the potatoes are soft when the casserole is pierced with a knife, about 65 to 75 minutes. 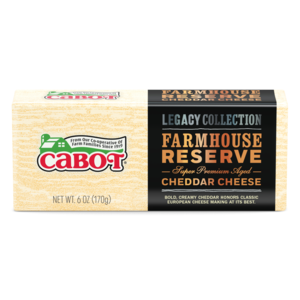 Remove parchment and foil, top casserole with the remaining 1 cup of shredded Cabot Farmhouse Reserve, and continue baking until the cheese is melted and golden, approximately 10 to 15 minutes. Before cutting and serving, let casserole rest for at least 15 minutes. In the mood for another hearty, flavorful au gratin? Try our Spaghetti Squash Au Gratin next! Cabot is a co-operative of over 800 farm families who continuously strive to produce the best dairy products around. If you enjoy this Brussels sprouts au gratin recipe, we’d really appreciate it if you could rate and review it! Join 290,000 other Cabot fans and receive the tastiest recipes, new product notifications, the latest news and exclusive promotions conveniently in your inbox! PREHEAT oven to 350°F. Coat a 2½-quart casserole dish with cooking spray. MELT Cabot Unsalted Butter in a large saucepan over medium-high heat. Add flour and stir to make a thick paste. Add milk, whisking constantly and continue whisking until smooth. Bring to a simmer, whisking often. Remove from the heat and add 2 cups of shredded Cabot Farmhouse Reserve and whisk until smooth. Add Dijon, salt, thyme, pepper and nutmeg and whisk to combine. Cover saucepan with the lid and set aside to keep warm. LAYER about one third of the sweet potato into the prepared casserole dish. Top with one third of the Brussels sprouts and shallot. Pour one third (about 1 scant cup) of the cheese sauce over the vegetables. Repeat with two more layers of sweet potatoes, Brussels sprouts and cheese sauce. Cover with parchment, then aluminum foil. BAKE until the potatoes are soft when the casserole is pierced with a knife, 65 to 75 minutes. Remove parchment and foil. Top casserole with the remaining 1 cup of shredded Cabot Farmhouse Reserve and continue baking until the cheese is melted and golden, 10 to 15 minutes. REST the casserole at least 15 minutes before cutting into portions and serving. Recipe and photo courtesy of Katie Webster. Be the first to know about new recipes & get access to exclusive content! Certified B Corp: Working to enrich the legacy of our farms, our families, and our communities.